The Alibaba stock price was down as much as 8.2% today after the Chinese e-commerce company had a weak earnings report. Shortly after the opening bell, Alibaba Group Holding Ltd. (NYSE: BABA) hit an all-time low of $71.03 per share. Investors were disappointed with Alibaba's revenue figures. Alibaba reported revenue of $3.26 billion for the quarter, which missed estimates of $3.39 billion. While revenue was a letdown, earnings per share (EPS) beat. EPS was reported as $0.59, which topped estimates of $0.58. And sales still grew an impressive 28% in the quarter. Profit grew an impressive 148% to $4.97 billion year to date. The company also reported gross merchandise volume jumped 34% in the quarter. The number of annual active buyers increased 32%. Mobile figures, which have become some of the most important metrics for the company, were also impressive. Mobile transactions now account for 55% of Alibaba's total transactions. That was up from 51% last quarter and 33% last year. Alibaba now has 307 million mobile users. That's up 63% from last year, and it's almost equal to the entire population of the United States. Company officials also announced they have authorized a $4 billion share buyback program. At today's low, BABA stock is down more than 30% year to date. 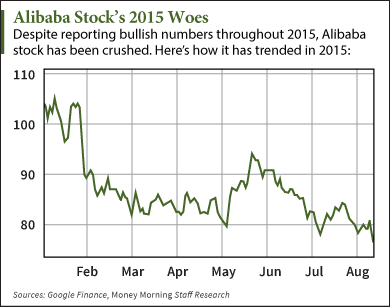 The Alibaba stock price has fallen 40.8% from the high of $120 it hit in November 2014. So why is Alibaba stock falling when most of the numbers are bullish?